Most people have kitchens already overloaded with bulky appliances. Many people don’t have the biggest apartments or houses either. In these cases, sometimes an air fryer doesn’t make the best investment. Don’t get us wrong, a large capacity air fryer makes a sweet addition to a larger kitchen, especially if you have a more generous budget. Our overall pick, based on a range of factors including price and value, is the Cuisinart TOA-60. You’ll enjoy all the advantages of an air fryer without the limitations. With 7 cooking functions and a spacious interior, this stainless steel beast is an asset to any kitchen. 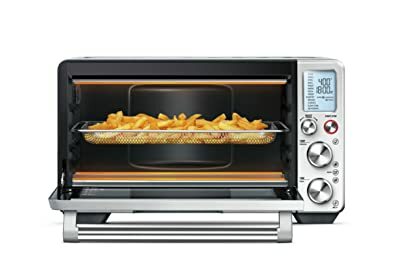 If you’ve got the cash to flash and you insist on a single appliance with far more scope than an air fryer alone provides, this 13-function smart oven comes laden with accessories. Easy to use, a breeze to clean and coming from a stellar kitchen brand, you can’t beat the Breville Smart Oven, our upgrade pick by some margin. Air fryers, as we looked at recently in some depth, allow you to sidestep deep fried food and cook using as much as 75% less oil to achieve a delicious golden brown finish to your fried food. We won’t pretend you’ll get an exact replica of those deep-fried treats you sometimes crave, but you’ll do wonder for your heart health and your waistline by air frying instead. Also, you’ll be able to cook a pretty wide range of other foods in your air fryer that you wouldn’t normally associate with deep-frying so they’re extremely versatile. With air fryers, the food is cooked by hot oil being sprayed over the food rather than allowing the food to sit in the oil thereby reducing oxidization while still creating the Maillard reaction needed to give fried foods that unmistakable crispiness and crunchiness. While air fryers work well, they are also slightly limited. Convection ovens are an alternative to air fryers and they operate on much the same principle as the oven you might see in a bakery. They tend to be roughly double the size of a toaster oven. Hot air heated at the bottom of the oven by an element naturally rises with the cooler air pushed down so it can be heated by the element. With fans pushing the air around, you’ll get super-swift conduction and a quickfire, even result whatever you’re cooking. Another option at your disposal is a toaster oven which you can also buy in countertop form. This is a more efficient alternative to a regular oven and you’ll be able to impart that crisp brownness to your foods that you simply can’t achieve using a microwave oven. Ever tried to cook bacon in the microwave? We have and, while it’s edible, it’s absolutely not the taste sensation you’re looking for. Do you notice another problem now, though? Well, if you want to move beyond a simple air fryer, getting multiple appliances is not only expensive but also takes up a huge amount of unwanted space in the kitchen. Luckily, there’s an easy solution with the combination units we’ve brought for you today. In case you’re wondering why we only have two models for you, we’ll be honest: there are many very poor quality products in this sector of the market. 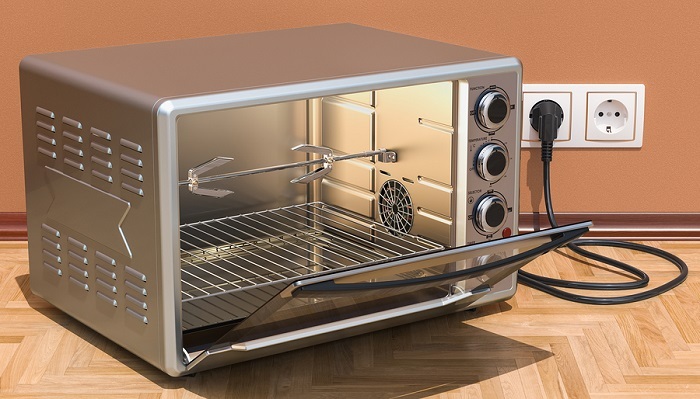 We won’t name and shame any of the worst offenders but if you come across any air fryer and toaster oven combos outside of the pair we review today, we’d advise exercising extreme caution. So, with these multipurpose units, you’ll get all the benefits you’d expect from an air fryer but with a great deal of added functionality. The toasting feature allows you to potentially get rid of another appliance. You’ll be able to broil and bake, too. You can even warm your food through with both of the combination ovens we look at below. In summary, you’ll get everything you would expect from a standalone air fryer but without the restrictions meaning you’ll get superior value without sacrificing the health benefits. Without further ado, we’ll give you the lowdown on the Cuisinart and Breville combination units that that stand proud in a crowded market. 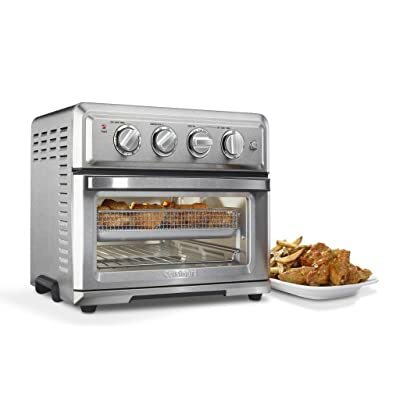 The first of our air fryer and toaster oven combos comes from the kitchen stalwart Cuisinart. For such a highly capable and multi-functional appliance, the TOA-60 comes in at a surprisingly keen price point. You could pay much, much more for a limited air fryer given you little of the flexibility up for grabs here. It’s not just versatility where the Cuisinart scores but also capacity. Measuring up at 15 ½ x 16 x 14 inches and tipping the scales at a hulking 21 pounds, make no mistake you’ll need plenty of counter space to accommodate. This unwieldy size carries the advantage of a cavernous interior, though. From toasting up 6 slices of bread so there’s breakfast for all the family through to chucking in whole pizzas and 4 pound chickens, you can feed all the family in a single sitting whichever cooking method you embrace. Capacity is 0.6 cubic feet. The Cuisinart offers you the health benefits of air frying so you can eliminate that deep frying so bad for your heart health but the additional functions include a pair of convection oven modes so you won’t feel quite so limited as with a dedicated air fryer only. 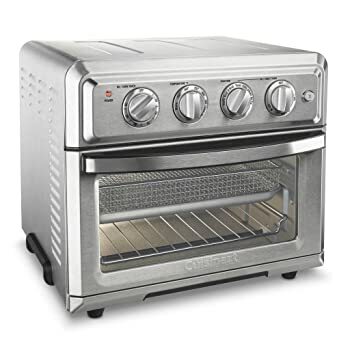 Despite packing such diverse features, using this combo toaster oven is a walk in the park. The ergonomic dials are housed front and center in a line of four. One allows you to set the function, another deals with temperature and a third the timing. You’ll even get a separate dial so you can get your toast just the way you like it. While LCD displays are all well and good, if you’re not the biggest tech-lover, you’ll adore the simplicity of the Cuisinart. The timer rolls up to an hour and there’s an auto shut-off feature so you can potter out into the garden without worrying about the appliance overheating or any kind of accident breaking out. This is a small but valuable extra. Along with the requisite rack, you’ll get a baking pan and a basket to help you with your air frying thrown in. The Cuisinart accepts generic accessories so you won’t be locked in and forced to purchase expensive extras. If you tend to cook using a wide array of methods and you want the shower of benefits offered by an air fryer without being restricted, the Cuisinart TOA-60 is a fantastic choice and you won’t need very deep pockets either. What are you waiting for? 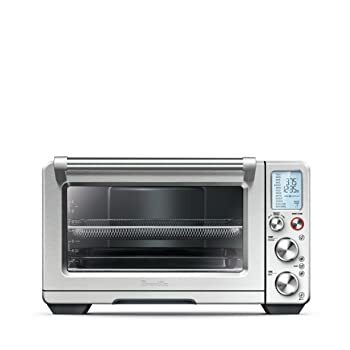 If money is no object and you want a remarkably versatile appliance giving you an air fryer along with plenty of other cooking methods at your disposal, the Breville Smart Oven is an intelligent addition to any kitchen. If you thought capacity on the Cuisinart was impressive, the Breville outflanks it by some distance. You’ll be able to toast over half a loaf of bread and also your favorite breakfast bagels. If you’re looking to rustle up a chicken or turkey, you’ll have room for a huge 14-pound bird perfect for the holiday season. This space translates to a full 1 cubic feet interior large enough to cater for even the most ambitious dinner party. Although this combo oven isn’t cheap, you’ll get plenty of extras thrown in along with the most robust cross-functionality on the market. Alongside a couple of durable racks, you’ll also get an air frying basket, a roasting pan, a pizza pan and a broil rack so you certainly won’t need to go shopping for accessories in a hurry. The 2 convection fans allow you to tweak the speed so you can get super-swift air circulation ideal for air frying, roasting and any dehydration you need to perform. For all other methods, you can adjust the fan to regular speed. If you prefer a display to accompany the user-friendly dials on your cooker, the Breville beat the Cuisinart on this score. Don’t panic that you’ll be swamped with fiddly tech, though. The interface is intuitive and you’ll have no snags using your Breville even if you’re not the hugest fan of gadgets. The light comes on automatically when the cooking cycle is complete and you can also exercise manual control over this for added flexibility. You won’t just get cooking power but also a remarkable even and accurate experience thanks to Breville’s patented Element IQ. No less than 6 separate quartz heating elements direct that power precisely where it’s needed with everything optimized on your behalf. There’s a good reason this is flagged a smart oven. Invest in the Breville and it might be the wisest and most adaptable purchase you make for your kitchen this year. As we outlined in our recent study of air fryers, this method of cooking offers a range of health benefits. The problem is, if you’re operating on a tighter budget, perhaps you don’t want to splash out on a limited appliance. This pair of combo ovens solve that problem head on and with both the Cuisinart and Breville we looked at today, you’ll get ample freedom to cook for the whole family just the way you like it. From toasting to baking, from air frying to broiling, these heavyweight cookers do it all. We’re taking a brief break from the kitchen this week and bringing you a batch of great sofas so, once you’ve whipped up a storm baking or roasting, you can take the weight off your feet and kick back.